Now that fall has arrived, winter isn’t too far away and with it will come colder temperatures, ice and snow. Not only will these elements become problematic for the roads we travel and our driveways, but they could wreak havoc on our homes as well, particularly our roofs and chimneys. What causes the damage to on top of our homes is the water that makes up the ice and snow. You might think with that in mind that water is the biggest threat to chimneys all throughout the year – which is in many ways true. However, winter brings the freeze and thaw cycle for moisture, which makes water most threatening during the winter season. Bricks are naturally porous, meaning water can infiltrate them easily. These holes in the bricks are all over, including the sides that are held together with cement. When water gets inside bricks from snow and then freezes in the low temperatures, it expands, which leads to cracks which become larger and larger as more water gets in and freezes. All of this water getting in can cause not only the chimney to fall apart or cause damage to your roof, but can lead to water getting inside of your home. This can damage or destroy attic insulation, lead to ruined wall coverings in your home, cause water stains to ceilings, or allow mold to form and grow. Fortunately, this damage is preventable through preventative maintenance. Waterproofing the chimney can go a long way in keeping it from falling apart. 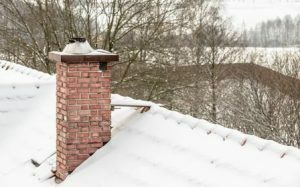 Another great way to prevent water damage is to get your chimney regularly inspected once a year to assess any signs of damage and have them repaired when necessary. Getting an inspection performed in the fall or spring annually can help you stay ahead of any damage and make sure that your chimney and roof are in good condition, protected from the elements and ready for the seasons ahead. If your chimney or roof has taken a beating and you are in need of a new installation or repairs, we can help. Roofing by Bruce can help inspect and repair issues with your roof, while Bruce’s Chimney Service has got all of your chimney and masonry repair needs covered. For more information, call our team today at 570-424-7250!